The Outdoor Anywhere hammock is a basic, open-style hammock made from three panels of fabric and gathered at the ends with a short, continuous loop of webbing. The side fabric panels are longer than most hammocks and the stitching is thinner and less bulky, offering a more comfortable lay across the stitching. The hammock includes a pair of daisy-chain-style webbing straps and a pair of steel carabiners. Let me risk a little in saying that I wasn’t expecting much from the Outdoor Anywhere Hammock. In the past few years I’ve seen hundreds of hammock companies crop up to ride the wave of hammock popularity among Millenials. That’s not to say that any of these copy-cat hammocks are bad. In fact, I would say they are generally all very similar, and therefor equally equipped at providing an awesome hang. In other words, don’t feel like you have to jump on the ENO bandwagon to get your ultimate hang. Truth be told, nearly every hammock is made from the same three factories in China, so what you pay for is often just a brand element and a feeling of being part of the crowd. However, I was very happy to discover that the Outdoor Anywhere hammock was a little different, in a few subtle ways. The hammock itself proved to be bigger (longer and wider) than listed on the web. I hope this is universal, as I realize some hammocks coming from a factory can have some variance, but the difference in what I measured was significant. The hammock is 81 inches wide (6.75 ft!) and 124 inches long (10.3 ft!). 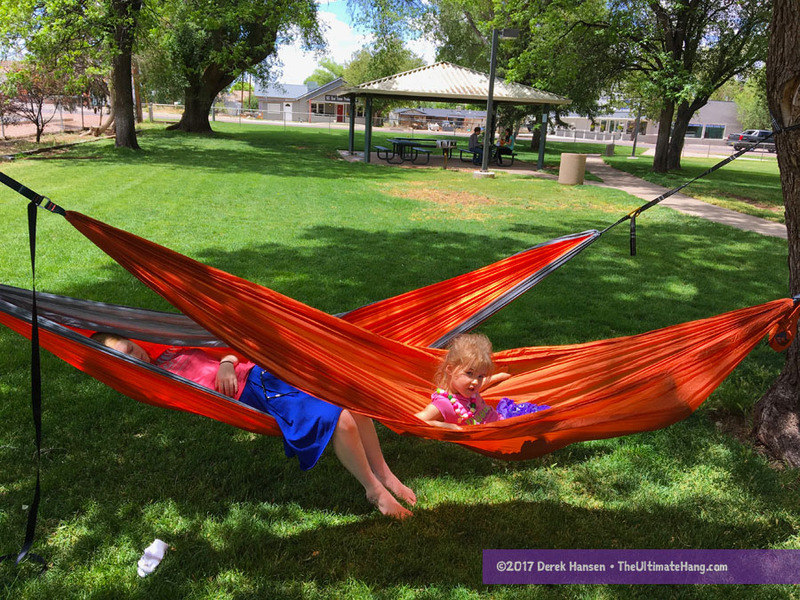 In the weeks I spent sleeping in the hammock indoors, I found the lay delightful, easy to find a sweet spot, and with a low stretch (less shoulder squeeze). I actually regretted that I had more reviews to do because I was getting such good sleep. Using the hammock at picnics and events was easy, thanks to the longer webbing straps. The spec sheet says the hammock is made from 210T (thread count) nylon, which is the same 70D (denier) fabric listed with other brands like ENO. However, the fabric felt lighter to me (not as thick) and had a smooth hand. I would venture to guess the fabric is a little lighter than what is stated, but I could be wrong (some finishing perhaps?). The other element that surprised me was the stitching. Most mass-market hammocks coming out of China use the same thick thread and triple-hooked stitching that ends up making the seams thick and less comfortable to lay on. I typically avoid laying diagonal across those seams, especially on my shoulder. However, with Outdoor Anywhere, the stitching is thinner and so is the reinforced seam. I was actually surprised to find that I slept across the seam often. Yes, I still felt it, but not to the point that I had to find another sweet spot. The included daisy chain-style webbing straps are great. I really appreciate when a manufacturer includes them. It’s not only the most responsible choice, it’s now a competitive selling point. The straps are narrower than I’d like, just shy of 1 inch wide, but were long enough to use out in the field. Daisy chain webbing straps make set up with a basic, open hammock super easy. I’m not a fan of the clunky steel carabiners, and I replaced them with smoother wiregate aluminum carabiners when testing (the steel biners tend to snag the suspension and are tougher to spring). I understand the cost decision, and yes they can be used, even if they are a pain. The webbing-style end loops on the hammock are very similar to the Therm-a-Rest Slacker Hammock. I really like this method as it loosens up the end a little and makes it possible to open up the lay a bit more. I liked the small details o the included stuff sack: a carry/pull handle on the end, and a carry handle made from the inch strap. The rounded bottom is also a nice touch, making the hammock feel more dressed up. The longer width and length make it easier to find a sweet spot and lay diagonally, when properly hung. A good 30° hang angle was just about right, followed by a 20° lay angle. This is a great all-around hammock and a good option if you’re shopping around for an open hammock. The included straps make the price point a great competitor to big box brands that are smaller and a lot more expensive. Suspension and Anchor System ♥ ♥ ♥ ♥ ♥ The included strap set and carabiners are solid, but I’d recommend upgrading the biners. Construction and Craftsmanship ♥ ♥ ♥ ♥ ♥ Mass-market construction, some loose threads. Modularity ♥ ♥ ♥ ♥ ♥ Open hammocks are the foundation to a versatile hammock kit. Price and Value ♥ ♥ ♥ ♥ ♥ Value-priced open hammock. Included daisy chain straps. Imported. You mentioned in the features … integrated bug netting …. was that a typo … if not, that truly is a great deal! Hi Vernon, yes the bug net was a typo! Sorry. Yikes! Sorry fellas. Fixed in review. First of all, I have to say I love your reviews. See, I had been looking for a good camping hammock (the ones I had barely lasted three months, I think I’m too heavy LOL) for some time until a friend told me to check your blog out, then I found this.It was fairly priced and from the feedback, I could tell it was going to last longer. Anyway, six months later, it’s still functional – my family loves it, I sleep on it almost daily. Thanks for the info, and keep informing us on the good stuff!! Hi Lauren, this is Bryan from Outdoor Anywhere. Really pleased to hear you are happy with the hammock.